Howdy readers! I apologize for the long delay in posts, but the last two weeks have proven to be crazy busy. I had hoped to get this post up by this weekend, but there was a pile of student papers that disagreed with me rather stringently. Nonetheless, we are back on track now, and I hope to get back into the swing of things. Time for another stride Into the Bronze Age! Well, here we are at last. This story, more than any other single issue, defines the thematic beginning of the Bronze Age proper. With this issue, Denny O’Neil and Neal Adams begin their famous run on this book, uniting DC’s two vermilion clad heroes to “discover America.” This was a huge sea-change in comics. We’ve already been observing the creeping turn towards social relevance and more serious stories, but that has been a fairly minor undercurrent in our readings. It is the O’Neil/Adams tenure on Green Lantern/Green Arrow that brings those minor eddies into the mainstream in full force. I’m afraid I’m probably not going to add too much that is really new to the discussion of these books, so be warned. Their importance really shouldn’t be undersold, as this was the series that taught the industry that comics were a medium capable of tackling important social issues like poverty, racism, and drug use. Of course, we’ll see the infamous issue where Green Arrow’s former sidekick gets addicted to heroin before too long in this title. There is no doubt that this is an influential run, but my goodness, I really, really dislike it. I understand its cultural importance and its status as a milestone for comics, but the problem is that these stories are all message and no subtlety, or perhaps more importantly, no joy. O’Neil, as we’ve already observed, has a tendency to be a bit preachy, but in this book, that tendency is given full reign. The result is an unbearably sanctimonious and mirthless series. Reading about poverty, racism, and drugs sounds like a ton of furn, right? Well, that’s part of the problem. The joy and excitement of superhero tales gets left behind in the race to brow-beat the audience with this month’s message. Now, this is not to say that comics shouldn’t deal with such issues, and I’m sure that there are a lot of folks running around today who had their eyes opened to some of our world’s problems by reading about them in Green Lantern. Still, I think such tactics, much like the trends in modern comics, tend to miss the purpose of a world with superheroes. Such a setting should really show us something to aspire to, something to hope for. It can and should be a better world, though not a perfect world. Of course, the main characters in this book suffer a similar fate to the stories themselves, quickly becoming entirely unlikeable. 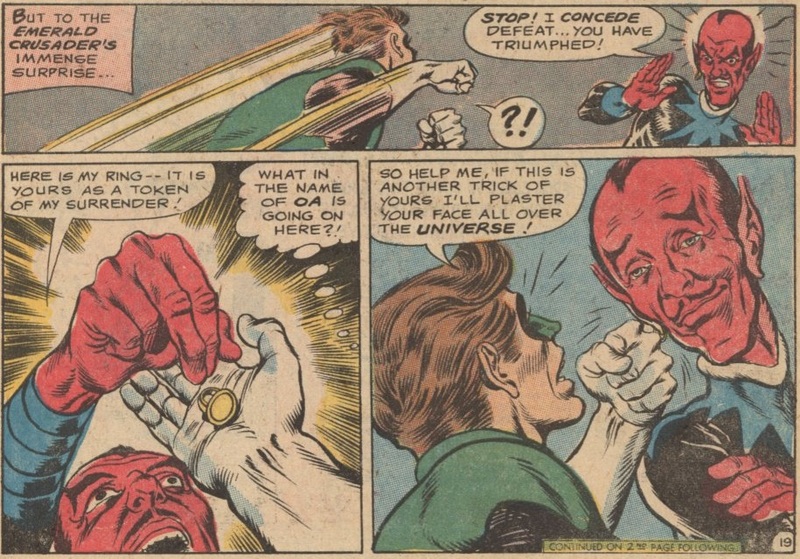 Green Lantern loses all common sense so that he can repeatedly be taught lessons, while Green Arrow becomes O’Neil’s mouthpiece, and thus, intolerably self-righteous, with a certainty of his own sainthood magnified beyond all reason by the fact that the stories constantly bear him out as right. The end result is a fascinating study of the time, but also a real chore to read these days. All of a sudden, Green Lantern’s world takes a turn for the ugly, and it happens so quickly, it must have given long-time readers whiplash! 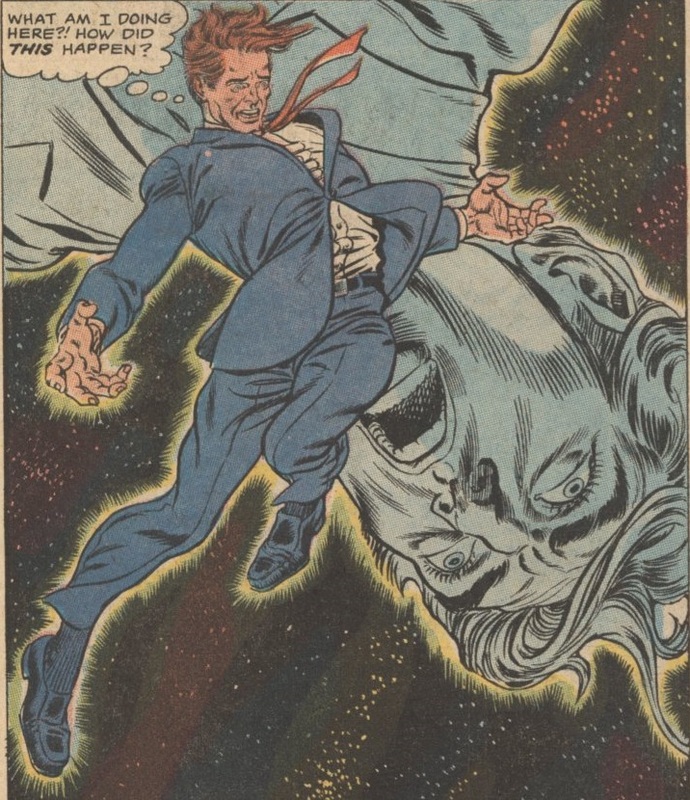 This issue famously opens with the Emerald Gladiator flying above Star City, when he sees a businessman being attacked by some street punks. He swoops down to the rescue, sending the young aggressor flying off to the police station and helping the older citizen to his feet. Having completed his good deed, Hal turns to accept the accolades that he knows will be forthcoming from the crowd, only to receive a shower of cans, bottles, and verbal abuse. It’s a funny, surprising scene, and it certainly accomplishes its purpose, which is to knock readers off of their preconceptions. It’s also a neat and unusual move, and it addresses a big problem with the standard practice of superheroes. How much of the nuance of a situation can you absorb when you’re jumping down from rooftops and skulking in alleyways? It isn’t easy to tell exactly what’s going on in every situation, and things like this would, in reality, probably happen quite a bit. On the other hand, I don’t read books about invulnerable sun gods that can fly or men who fight crime by shrinking because I’m obsessed with realism. Well, the Emerald Crusader turns to lash out at the crowd (! ), but he is stopped by Green Arrow, who has observed all of this. Already, Hal is coming off quite badly. Ollie gives Hal a quick tour of the particular slum he’s blundered into and explains that the fellow he saved is actually the local slumlord. Green Lantern is, quite literally, above such complaints. His job isn’t just to catch bank robbers or to stop muggers, he patrols the freaking cosmos. Ohh, I’m sorry that life is unfair, but let me ask YOU a question. Is it better to live in a slum and be ALIVE, or is it better to be space dust because I was chasing around after a slum lord instead of stopping the latest plot by a world-destroying menace? Gah. It galls me every time I read this story. Of course, the guy does have a point, and just about any other hero who ISN’T saving the entire freaking planet every day should probably be pretty convicted by this. But Green Lantern doesn’t fit the bill. I realize that this is part of what O’Neil is doing. He wants this contrast of powers and perspectives, and he especially wants to play with the concept of the Guardians of the Universe. It would have been a bit more palatable if Hal had kicked, at least a little, at this, because he has every right to turn this back on his interlocutor. But no, he hangs his head as if he’s the worst man in the world, and he begins his guilt-ridden journey with Green Arrow. The issue follows the Lantern as he attempts to make up for his mistake by persuading the slum lord to have a change of heart and spare the poor folks who he is about to force out on the streets, but, being a slum lord, the fat-cat has no heart. Thus, the Emerald Crusader’s words fall on deaf ears, and for the second time this issue, we see our supposed hero display a deplorable lack of self-control. I thought the whole ring thing was all about willpower, but oh well, O’Neil has a sermon he wants to preach…err…a story he wants to tell. The Lantern prepares to lay this slimeball out, only to be stopped mid swing by non other than the Guardians of the Universe! They tell him that the slumlord has committed no crime and order their ring-bearer to Oa, in no uncertain terms! They refuse to listen to Hal when he arrives, and then they assign him a seemingly menial cosmic task, diverting meteors and then just hanging about in space. Of course, this nicely illustrates why that earlier scene is so silly, as Green Lantern diverts massive chunks of space debris with a thought. Meanwhile, the Emerald Archer tries a different tactic with our resident scumbag. He takes a page out of fellow vermilion hero, Green Hornet’s, playbook, and Ollie pretends to shake down the slumlord, who promises, in turn, to meet with him later with a payoff. Here we get a particularly nice sequence that displays Arrow’s skill, as well as Adams’ excellence, as two of the slumlord’s errand boys try to take out the hero, only to incriminate their boss by falling for a dummy in a darkened room while being far too talkative. Unfortunately, the tape recorder Ollie hid next to the dummy, the target at which, we remember, he wanted the thugs to shoot, surprisingly got shot. That part isn’t exactly the Archer’s finest moment. Meanwhile, Hal gets feed up with sitting around in space and heads back, teaming up with Ollie to trick the slimeball into incriminating himself by impersonating one of his gunsels with the help of his power ring. This time the ruse works, and despite some last minute hysterics involving a grenade (! ), the slumlord is arrested. “Come off your perch! Touch…taste…laugh! And cry! Learn where we’re at…and why!” Ouch Ollie, just ouch. Yikes. Now, in general, I’m all in favor of earnestness in comics and in general, and I don’t like folks who react to all such honesty with a sneering, ironic disregard, but I have to say, there’s plenty to mock here, and justifiably so. The silliness of these stories was apparent even to readers in the 70s, and it is perhaps even more so now. I can imagine this story being appealing to an angry, angsty young man, as I was at 16, someone who is learning about how complicated the world is, and yet whose perceptions are still very simplistic. I’m afraid I’m at least a decade too late in life for this story. Nonetheless, it is an important issue, and it does help catapult comics truly into the Bronze Age. Adams’ art is beautiful, and there is definite value in comics wrestling with cultural problems. Green Arrow as the champion of the downtrodden is one of those great concepts that remain, sticking with the character forever more, even after the rough edges that attract criticism have been worn away. We’ve seen his brash, self-righteous personality developing just in the few months we’ve been following him under O’Neil’s pen. Even though this incarnation is too extreme to be truly likable, there is something good in that concept. In the end, this is a story more valuable for its cultural weight than its literary value or even its enjoyability. It is a flawed but fascinating beginning, and I give it 2.5 Minutemen, having taken points away for the glaring, galling ludicrousness of that exchange in the tenement building, as well as for Ollie playing the ‘Nazi’ card in his argument with Hal. Well, this is quite the weird story, and, honestly, I’m rather astonished that it got published. It’s strangely, inconsistently, and thoughtlessly dark. I can only assume that someone at the Comics Code Authority was asleep at the switch…or rock stupid. You’d never guess from the fairly conventional beginning that this issue of Superman would end with a straight-up suicide, but it does. You read that right, this Superman tale ends with a thinking, feeling being intentionally taking its own life, but I suppose I’m getting ahead of myself. Follow along, and see if you’re as amazed as I was. In fairly typical fashion, the issue opens with a set of aliens plotting against Superman for no particular reason. Interestingly enough, their plot entails creating a clone by scanning the Man of Steel as he passes by their world on his way home from a space mission. In a funny little sequence that really marks the bipolar nature of this story, the clone figures out he doesn’t have any powers by attempting to fly and landing square on his head, knocking himself out. 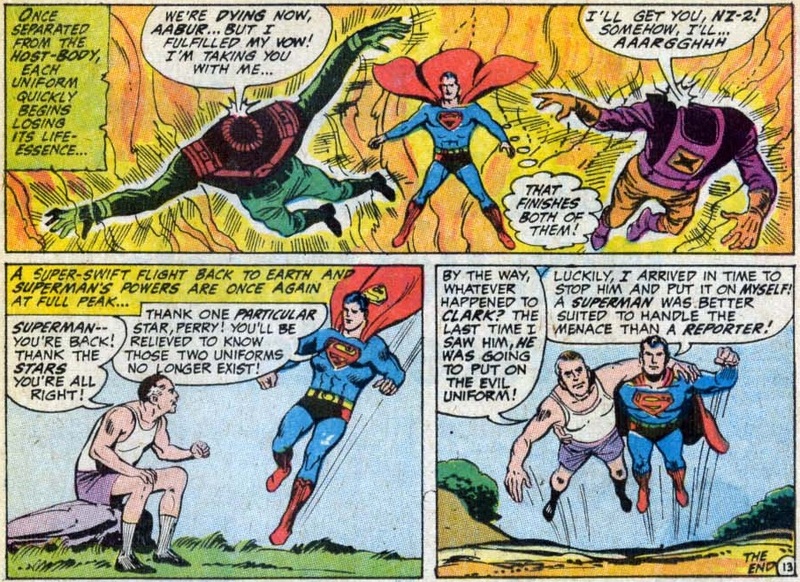 The Super-copy believes himself to be Superman, and the aliens encourage this, telling him that the real Superman is an impostor that has stolen his powers, planning to use them for evil. They assure their creation that he must destroy the “false” hero in order to reclaim his rightful powers and place, and they give him devices to aid him in this quest. Now, let’s get something straight. This is not a robot, not an unliving or mindless contraption. This is a living being they have created, with a mind and will of its own, and even though it is easily talked into attempting murder, it is not simple. Keep that in mind. 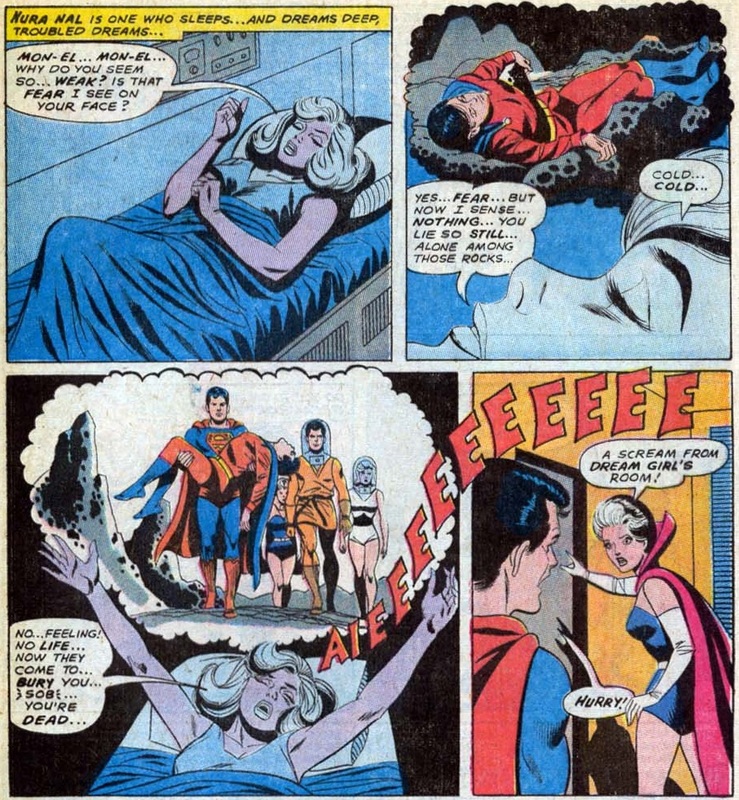 After being sent to Earth, the clone encounters several situations during which it is affected by its environment as Superman never could be. Because of an alien device implanted in its head, it transfers these effects, sniffling, sneezing, and other human reactions to Clark, causing him to feel everything the clone does. This plays a role in the small secret identity farce subplot that seems to be a contractual obligation of every Superman book. Having lost his weapons, the clone heads to the Fortress of Solitude to retrieve new devices powerful enough to do the deed. His counterpart, experiencing the intense cold of the arctic vicariously, makes an incredible leap in logic and deduces that it must, of course, be coming from his double, who he doesn’t really know about, and from the Fortress, which he has no real reason to think endangered. Plot contrivances aside, The Man of Tomorrow manages to capture his double, and attempts to break his conditioning and figure out his story. However, nothing works, so Superman turns him over to authorities, sends him home, or puts him in the Phantom Zone, right? Nope, none of those relatively reasonable solutions are even considered. Instead, our “hero” decides the the only viable solution, because his double transmits all sensations back to the original, is to keep him locked in a small cage, too tiny for him even to lie down in, for all of eternity. ‘Cruel and unusual’ is for chumps! That doesn’t apply to superpowered sun gods from space! To make matters even worse, Superman seriously considers straight-up murdering the imposter in order to solve the problem, and the only reason he doesn’t is that he has “conditioned [himself] against killing for too many years. It’s a good thing The Man of Steel’s moral code is so famously flexible, otherwise that might strike me as a bit off. That’s right, Superman seriously considers flat-out murdering his double. After what must be weeks of imprisonment, judging from the impostor’s super-beard, he realizes that his rival is, in fact, the real Superman, a shattering revelation. The clone has a moment of clarity, and he figures out who and what he is, and he refuses to let the aliens use him to endanger the true Man of Steel. So, how does he get out of this predicament? How does Dorfman tidy up the Superman mythos and dispose of this duplicate? Well, he has him commit suicide, of course, with a pistol-looking device, no less! The double gets a Superman robot to give him a metal-melting ray, which is no threat to the cage or the bot, but the clone turns it upon himself, destroying the device implanted in his brain and killing himself. He even wrote a suicide note for Superman! How did this get published?! That is freaking dark, and it is an incredibly incongruous end to this goofy story. Superman’s tears at the end are poor recompense for the clone that gave its life to protect his. Ugh. I truly don’t care for this story. This was way too heavy of an ending to be treated so cavalierly, and it threw the tone of the entire issue wildly off. Unfortunately, this isn’t even the type of ham-handed attempt at depth that we just saw from Green Lantern. No, this is just a tone-deaf train-wreck of a tale that seems completely oblivious about what it is doing. I’ll give it a clumsy 1 Minuteman. Our vague and confusing adventure continues! We have this lovely Nick Cardy cover with Titans abandoning their costumes and running towards a bold new direction! Except, no-one really seems to know just what that direction is. One thing is certain; it is just plain strange. Inside, we pick up where we left off, with the robotic ‘man Friday,’ Angel, leads the Titans into danger. To make his point, the robot obligingly gets its armed blown off by a laser. This catapults the Titans into a series of death traps that they navigate without using their powers…for reasons. When they manage to escape, they find mysterious Mr. Jupiter waiting for them, drink in hand, like he’s watching whatever happens to be the rich guy equivalent of a ball game. There’s something off about this guy, seeing as he casually watches teenagers fight for their lives. Having survived the obstacle course, which Jupiter unconvincingly claims was never really deadly, he orders the Titans to go into the inner-city neighborhood “Hell’s Corner,” not to be confused with Hell’s Kitchen, get jobs and blend in. Their funds for this effort? A single penny and another super helpful and super vague prophecy by Lilith. Yes, thank you, that is just great. You are a super valuable part of this team. In Hell’s Corner, the Titans, in mufti, encounter a little girl selling lemonade, as well as rejects from every 60s biker movie ever. The head biker punk, complete with scarf, goggles, and jodhpurs, wreck the kid’s stand, just to sufficiently illustrate how bad he and his friends are. The Titans restrain themselves from delivering a richly deserved beating to the resident loud-mouth and his cronies, remembering the terrible tragedy caused by their last violent efforts, when the esteemed Nobel Prize winner died in a crossfire last issue. A young man with no such hang-ups, piles into the punk. He turns out to be the youthful Mal Duncan, the girl’s big brother, and he’s decided to put the overdressed bully, “Storm,” in his place. As the gang prepare to “flatten” the fiery Mal, the Titans finally take action, whipping the biker-types in short order. The young man is not terribly grateful for the help, and he tells the Titans that they are in the wrong neighborhood. 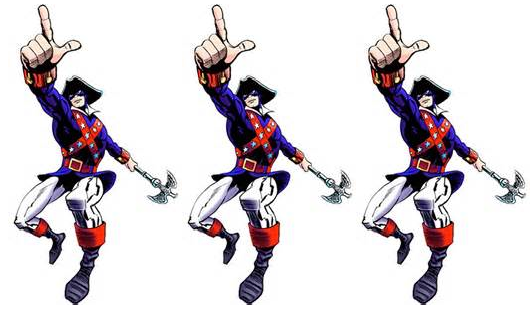 Nevertheless, the teenage heroes are determined to fulfill their mission…for more reasons, so they find various jobs around the area. In a corny but funny montage, we see Hawk getting work as a boxing instructor at the neighborhood boys club while Don becomes the next Bob Ross, encouraging his students to “paint what you feel,” whether that be orange skinned people or happy trees. It’s a simple but effective distillation of the personalities, though, I admit, peaceful ubernerd that I am, even I sort of want to dump Don’s metaphorical books, just for being such a touchy-feely wuss. The club puts on monthly boxing matches to help kids work off steam in a controlled environment, something that I imagine schools these days might benefit from, but I digress. Mal and the fashionable punk Storm square off, but the bully proves to be a sore loser after the young champion manages to knock him out. The local gang decide to work Mal over after the fight, but the Titans intercede, putting the biker-flick rejects down for the second time. Feeling understandably a bit outclassed and undeserving of a spot on a FREAKING SUPERHERO TEAM, Average Boy faces sleepless nights and self doubt, so he decides he must prove himself. How will he do so? Will he fight a villain, stop a crime, or maybe just overcome a training challenge? No, don’t be silly, those obstacles are far too insignificant for mighty Average Boy! No, instead, Mal decides to hitch a ride on a space rocket not designed to actually have a human pilot, because apparently it is super vital that NASA get human reactions from this space flight, and it isn’t like they have any trained astronauts whose job that is or anything. The team is stunned to discover that Average Boy has done something so colossally stupid and so utterly necessary…for reasons once again, but Mal is happy. He declares, in what would actually be a sort of cool moment if the story warranted it in even the tiniest fraction, “I’m in my own groove at last! Doing MY thing! And I’m a first! A cat from Hell’s Corner reaching for a star!” While the 60s slang is painful as always, the thought of a black astronaut, especially one from an impoverished background, breaking down barriers is actually really cool. And that’s the problem with this issue, and this arc, in general. There are some cool elements here, most notably Mal and the racial undercurrent he represents. I like the character, especially as I’ve gotten to know him in other mediums, like Young Justice. I think he’s got great potential, but this story makes no freaking sense. There is not one thing about this plot that works logically. Everything is happening because the plot requires it to do so. I can’t stand that kind of silliness. I’ll be quite happy when Aqualad shows up in a few issues to knock some sense into the Titans…at least, I hope that is what is going to happen, judging from the cover. So, I give this irrational issue 1 Minutemen. Sheesh, this was an extremely dichotomous month. We had three fairly enjoyable stories in the first half and three mediocre to detestable stories in the second. I admit, part of the reason this post took so long to put together, aside from my being insanely busy, was that it was such a poor lot of stories that I had a hard time working up the energy to discuss them. Still, we stand at an important moment, with the Bronze Age taking a big step forward with the start of the Green Lantern / Green Arrow run. As much as that book gets on my nerves, I do believe it is going to lead us to bigger and better things…eventually. One thing is certain, this month, short on books as it was through the vagaries of publication schedules, was certainly long on innovation! We have the brilliant SAG team doing fascinating things in Aquaman with both story and art, we have Adams’ setting the comic world on fire with his beautiful, realistic pencils, and we had several plot elements that, however lacking they may be in logic or enjoyability, are certainly creative. I suppose I can endure three bad books for three entertaining ones. That still beats the proportions on student papers! Well, that does it for this month! I hope the next month has some better stories in store for us! In an attempt to go ahead and get this post up, I’m going to cut out the bonus feature for this month and add it on to the coverage of the next. I somehow missed two new head-blows, but I’ve added them in. Welcome Robin and the Phantom Stranger to the wall of shame! Our trek into the Bronze Age continues! And so does the evolution of this feature. I’m going to add a little historical information to set the scene and provide some context for the comics I’m covering. Each month’s first post will feature a couple of notable events and, stealing shamelessly from the ever entertaining and delightfully British Fantasticast, will also include that month’s longest reigning #1 single. As you can see, these are turbulent times we’re touring. And quite fittingly, this month’s #1 song was “Bridge Over Troubled Water.” As an aside, Garfunkel is a weird looking dude. Just saying. Now, to the comics! Wow, what a switch from the last issue and the first half of this story! Don’t let that gimmicky cover fool you. Even though this issue may have been born out of someone proposing the asinine question, ‘hey, wonder if there would be a retirement home for old superheroes?’ this story rises above such silly beginnings. It looks like this tale is going to be exactly like its predecessor, rife with Silver Age silliness, but while there is certainly some of that to be found here, the whole actually hangs together remarkably well. That’s the key difference between this story and its first half. This one is surprisingly logically consistent. We join our hero, the time-lost Man of Steel, still banished from his home time and seeking solace in the far future. He leaps forward in time once more, this journey taking him to the year 121,970, where he finds a devastated world, poisoned by nuclear war. Right from the beginning we see that this is a more interesting, thoughtful story than the previous offering from Action Comics. Superman is wrestling with the unexpected loss of the life he knew, and in a fit of rage he destroys a cliffside that’s been fused into glass. It’s a nice little moment. He sees his aged reflection and is confronted with the reality of his loss, lashing out in anger. That’s more emotion from the Man of Might than we saw in the entirety of the previous issue. The Time Trapper observes this outburst with glee and reflects on the events of that past story. Finding nothing to assuage his sorrow, Superman once more lives up to his more esoteric nickname, the Man of Tomorrow, by traveling further into the future. There he finds an interesting world. On the one hand, it’s taken right from the Jetsons, complete with skyscraper buildings that house humanity above a sea of poisonous atmosphere that blankets the planet. On the other hand, the way the world got to this point is really quite intriguing and unusually thought-provoking for a story from this era. Superman finds himself surrounded by strange floating robotic sentries that arrest him for using superpowers (! ), hauling him before the leaders of the world. They recognize him, but at least this time it is played as something of an unusual occurrence instead of having this 100 centuries old superhero instantly known by everyone in the future. It is from the powers-that-be that Superman learns the sad history of this era, and an interesting story it is. It seems that thousands of years ago a trio of super beings, much like Superman himself, came to Earth. They were benevolent, protecting and caring for the people of the planet, and in turn the citizens showered them with love. Yet, love was their undoing. The three beings were two men and one woman, and the men fought over their female companion. Theirs was a war that lasted only two days but which was so incredibly destructive, especially from the damage of their “proto-vision,” that it left the entire Earth poisoned in its wake. The beings, the Naurons, fled, leaving the world a wasteland. In response, the survivors banned the use of all superpowers, which seems like a fairly sensible precaution after such an experience. This is quite the interesting little throw-away detail, or so it seems at the time. It is a rare moment of perspective from a comic, especially a DC comic, of this era. The presence of beings as powerful as Superman would be an incredible threat to the worlds they call home, and if they were any less careful and dedicated than he is, a tragedy would be inevitable. This has been explored quite well in later years, of course, but the tale of the Naurons is certainly noteworthy in context. It adds a different, though also somewhat sombre note to the story of Superman’s exile. 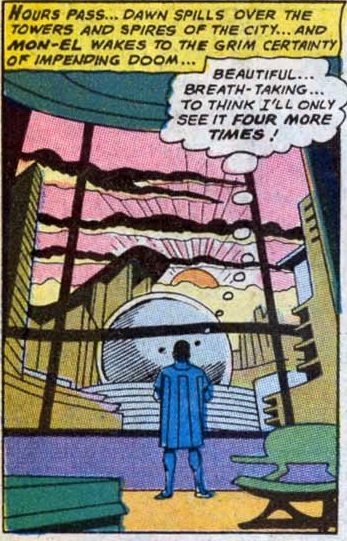 Well, Superman decides to explore this time a bit more, being careful not to employ any of his powers, and he happens upon the future incarnation of the Daily Planet, complete with nifty floating sign. Inside he first discovers that it is no longer a newspaper; as the Man of Steel puts it, “the printed page must be ancient history in this era.” This is another surprisingly thoughtful detail in this story. While comic writers could easily imagine the future with flying cars and push-button houses, they often had some of the most interesting blind spots for other elements of life in such an era. Next Superman happens upon the archives of the video-paper and learns what had happened to his friends after he disappeared from his native time. We discover that Lois apparently never got over her thing for Superman, as she married the actor who portrayed him in the movies. I think I’d call that unhealthy and more than a little creepy. ‘Hey, you look like my vanished love, so I guess you’ll do. Would you mind wearing his clothes too?’ Jimmy Olsen fared better, writing a best-seller about his adventures with the Man of Steel and finally finding enough dignity to call himself James…but not enough to stop wearing bow-ties. Before he can learn anymore (one wonders what happened to Batman and the League without their heaviest hitter), Superman gets kicked out and goes back to wandering the streets. He sees an accident about to occur, and unwilling to let any law prevent him from saving a life, leaps into action, only to be arrested again! This time they have no mercy and banish him to another world! Here is where we get to what on the cover seems like a goofy concept, but what, in context, actually makes sense. It seems that this is a retirement center of sorts for aging heroes, men who could not fit into civilian life or who violated the law in their attempts to help. In a sense, it’s a cushy prison for metahumans, a logical necessity if you’ve outlawed powers. This places inmates are embittered, holding on to their past glories, but they immediately take to Superman, having long revered his legacy. It makes sense that there would be somewhere to put heroes who broke the power laws, and it also serves to underscore Superman’s own sense of emptiness and uselessness, so this hero retirement home actually works in this story, strange as it may seem. The Man of Tomorrow finds himself on this world only a short time before a dignitary from Earth arrives, begging for the help of the banished heroes. They basically tell the guy where he can go, but Superman sways them with an impassioned speech…or rather, he basically says, ‘hey, come on guys…come on!’ and the heroes, apparently senile and easily influenced, immediately get on board. Anyway, heroes, weakened by age and sorrow, don’t think they can save the city, but Superman once again displays his quick wits, as well as his natural leadership abilities. He leaps into action, deploying his super-powered squad all around the solar system in pursuit of various materials, which he uses to create blast shield that will focus the force of the explosion downward. When the tower goes up, Superman uses his own impervious form, spinning at super speed, to further contain the explosion and turn the building into a rocket, sending it harmlessly into space. It’s a clever solution, and it’s a nice sequence of pages, with the elderly champions chipping in to save the day. Finally, the story ends with Superman journeying on further into the future, not even bothering to say goodbye. As he flies, he ruminates on lost opportunities. “Why didn’t I marry Lois?” he wonders as he is secretly observed by the sinister Time Trapper! It’s a nice note to end on, keeping the melancholy undercurrent of the story alive, despite the seemingly happy conclusion of this adventure. This is a really fun, surprisingly thoughtful and interesting story. Now, I’m being generous here, as there are certainly silly elements and moments throughout it, but the whole thing holds together remarkably well considering its origins. Pretty much every element that is introduced makes sense, and there are really thought-provoking pieces to this story, including the war of the super-beings and Superman’s own sadness at being banished from everything and everyone he knows. While I’d hardly call this story soulful or truly melancholy, it certainly has elements that a generous imagination can magnify into more than the sum of their parts. I also wonder if the concern with devastated, dead, or poisoned worlds might reflect the growing environmental consciousness being displayed in JLA this and last month. I can’t say for sure, but it does seem like a curious bit of synchronicity. 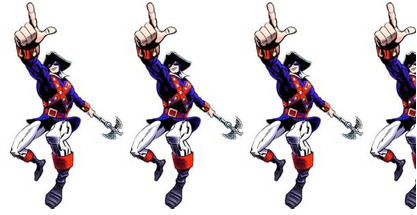 All-in-all, I’ll give this tale 4 Minutemen out of 5. That brings us to this month’s Legion backup. For once, the backup doesn’t overshadow the feature, which seemed to be the trend for the last two months. 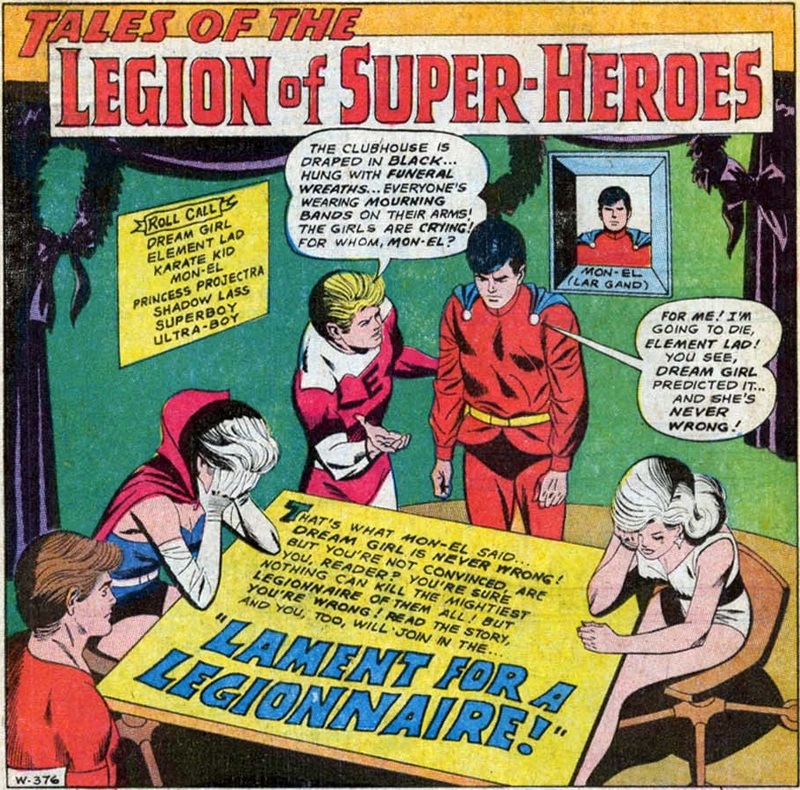 Still, this is a fine Legion tale, and it too features a neat, unusual element. The adventure begins on the prison planetoid of Takron-Galtos, a Legion fixture I’ve encountered once or twice before. I like recurring elements like this. They make the universe of these stories seem more complete, more filled out and lived-in. Anyway, we meet two prisoners who are due for release. In a scene out of a Clockwork Orange (though, interestingly this comic predates that movie by a year! ), both inmates are given “prism therapy,” which apparently brainwashes them into doing good. Shades of Doc Savage! The two prisoners claim to be transformed and to feel remorse for their actions. The woman, Uli Algor, an old foe of the Legion’s, has actually faked her reformation and immediately sets out to destroy the heroes of the future! The method by which she defeats the “prism therapy” is rather hokey, as she effectively just says, ‘hey, I used light to fight the Legion, so I made myself immune to all forms of light!’ Wow, I wish I knew it was that easy! I’ve shot guns, so I should have just made myself immune to all metal! Silly me! Anyway, several of the Legionnaires are out on the town, viewing *sigh* a “time-scope,” showing a 20th Century prize fight and noting that the ‘barbaric’ sport of boxing has been outlawed for hundreds of years. Remember that, as it will become strangely important later on. Our uninterestingly named villainess challenges the heroes, Lightning Lad, Saturn Girl, Cosmic Boy, and even substitute hero Night Girl, to a fight. She quickly dispatches each of the heroes by turning their powers against them with her advanced equipment. Lightning Lad is short-circuited, Cosmic Boy is thrown into a wall with bone-breaking force, Saturn Girl is given wide-awake nightmares, and Night Girl is blinded! All things considered, I think Night Girl got off rather easily by comparison. I like that panel of Saturn Girl’s nightmares. It’s pretty neat, and the menace is palpable. No, here’s where we get something a bit unusual. The heroes don’t just pick themselves up and dust themselves off. No, they are well and truly defeated, and the next scene is Brainiac 5 and Karate Kid visiting them in the hospital where they are all entirely incapacitated. It’s a surprising scene, showing the consequences of a loss for our heroes, and while they will all be okay, it is clear that they were hurt pretty badly. I particularly like the image of the heroes in the pitch-black room, only their goggles standing out. The whole scene has the effect of reminding us that our heroes are actually playing for high stakes and implies that their victory is far from certain. The remaining heroes, Brainiac 5, Ultra-Boy, Phantom Girl, and Karate Kid, receive a a second challenge from Algor (not to be confused with another future-dwelling Al Gore), and they choose a junkyard asteroid as their battleground. Despite Brainiac 5 preparing the ground and rigging the junked spaceships littering its surface to trap her, Algor manages to escape, inadvertently bringing Phantom Girl back to her hidden base. The villainess is ready for the young heroine’s intangibility, however, and takes her out. This enrages her boyfriend, Ultra-Boy, and he sets out to bring Algor down. She plans how to counter each of his many superpowers, but is so wrapped up in what she’ll do in this, that, or the other circumstance, that she allows the fighting-mad Legionnaire to walk right up to her and belt her on the jaw. She was prepared for any of his powers, but not for old-fashioned boxing, it seems! Now, the story assures us Ultra-Boy isn’t using super strength, and it lampshades the fact that he is hitting a girl; yet, it is still a bit off-putting that he just straight-up socks this woman in the jaw! It’s rather surprising in a 1970 comic book, and I have to admit that my old-school Southern gentlemanly upbringing quails a bit at that image. The resolution is a bit silly, as even if boxing isn’t allowed as a sport, the Legionnaires clearly have some hand-to-hand training, so a punch to the face wouldn’t be quite as innovative as Ultra-Boy seems to think it is in this story, especially for someone like him, who often engages in fisticuffs. Algor’s very convenient powers are another weakness of this story, as she seems to have the power of ‘plot.’ I imagine that is why she didn’t really become a major Legion foe. That, and she doesn’t really have much personality, but there is only so much you can pack into an 11 page story, and master of continuity, E. Nelson Bridwell has already got this one stuffed to the gills. Despite those few weaknesses, this is definitely a fun story, and the injuries sustained by the first tea of Legionnaires really helped to raise it above the herd a bit, giving the whole tale a more serious feeling. I’ll give it 3.5 Minutemen. This is a fine Batman tale, a good, classic style murder mystery, though the ending is a bit of a cheat. We are back to the dark, brooding detective Batman once again, and that’s always a good thing in my book, though it emphasizes the unevenness of the character’s portrayal across the line at this time. Our story opens with Batman rushing to a payphone where he hears the taped confession of a murderer, though the man says the Caped Crusader will never live to use it, as the entire phone booth explodes! It’s a literal ka-pow moment and a nice beginning for our tale. Cut to the previously discussed Victims Inc. office of Bruce Wayne, where he is visited by a strangely silver-haired Marla Manning, a young woman (and it rather bothers me that no-one comments on the fact that this 20-something woman has white/silver hair!) whose columns inspired Bruce to start his organization. She is there because she was investigating a car bomb that claimed the life of a city clerk and she has received a warning to “lay off!” Bruce goes to check his files, and discovers that this particular file has been stolen! He tells her that this is now a case for Batman, which seems a bit cavalier with the whole secret identity thing, but not the worst offense we’ve seen recently. *cough*Superman*cough* Then, properly attired in cape and cowl, the Dark Knight detective goes to interview the victim’s sister…by knocking on her door. It’s a rather incongruous image, seeing Batman in 70s grim avenger-style art knocking politely at a door while standing in a well-lit hallway. The sister isn’t talking, and Bats deduces that she’s being threatened, so he bursts in and disarms the gunman in a rather nicely drawn scene. Irv Novick may not be in the same league as Neal Adams, who will shortly become THE artist associated with Batman in this era, but he’s no slouch either, and he draws a dynamic, powerful, and resourceful Caped Crusader. Unfortunately, the killer gets away, leaving the Dark Knight without a lead to follow, so he reexamines the case and decides to investigate a construction company that won a bid the murdered clerk had been involved in. While snooping through the company’s records (and unlike a true Silver Age story, we don’t get any tortuous justification for Batman clearly breaking the law to do so), our stalwart hero discovers that Zachary Nova, the head of the Nova Demolitions company has just the skill-set needed to handle the car-bomb, having been a demolitions expert in Vietnam. Nova catches him spying, and gets the drop on the detective, but Batman is able to turn the tables on him, leading to a tense stand off involving some really rather casually stored explosives. If Batman can’t pin a murder on the guy, at least he can totally get him for unsafe working conditions! Nova, clearly more than a little crazy, threatens Batman with a bundle of TNT, and the Dark Knight leaves without finding any proof. Next, the Cape Crusader rather blithely decides to put Marla Manning’s life in danger. He has her print a story claiming she has some proof about the killer and making herself bait. The reporter gets a call from Nova, who says he knows she doesn’t have any proof, but he’s willing to sell her some if she’ll meet him. Batman insists on making the exchange, which brings us back to that deadly phonebooth! After the Dark Detective’s seeming demise, Nova emerges and threatens Marla, but he is suddenly assaulted by his disembodied voice! 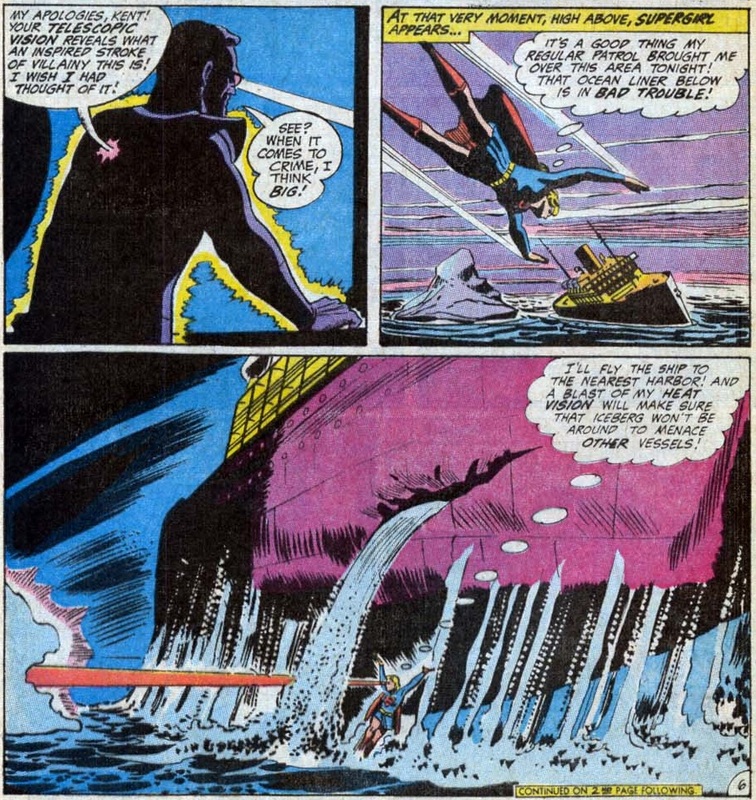 Nova panics and empties his gun, then Batman tackles him from the shadows. That brings us to the rather cheap explanation of Batman’s survival. Apparently he had a life-sized dummy UNDER HIS CAPE! He threw it in the phonebooth and dove for cover. Other than that somewhat silly explanation, this is a solid issue. It isn’t great, but there is a fair enough mystery and Nova makes for an entertaining enough villain, even if there isn’t all that much to him. The mystery would be a bit more substantive if there were more than one suspect, but it effectively wraps everything up in one issue. I’ll give it 3.5 Minutemen. We return again to the Brave and the Bold, the private comic fife of Bob Haney! For all of his quirks, something Haney could do quite well was a character-focused story. He was surprisingly good at turning in a tale bursting with genuine character development, where a hero or heroine went through a personal arc between the covers, but there was a catch. The character being developed often bore little actual resemblance to the mainstream DC hero he or she was supposed to be. What’s more, all of that character work was usually promptly forgotten by everyone, including Haney himself, about five minutes after the issue ended. This trend gives rise to the old joke that Zaney Haney stories take place, not on Earth 1 or Earth 2, but on Earth H, for Haney. Yet, despite the, well, zaniness of such stories, they are still noteworthy for providing real character growth and change (however short-lived) in an era where DC Comics very rarely engaged in any such storytelling. Where Haney really shined is with characters that were, at the time, largely forgotten. There was no real established continuity for him to flaunt, and thus no other writers to ignore what he had done. Over the course of the next few years, Haney will produce several fairly interesting, though fittingly insane, stories about mostly forgotten characters from the Golden Age. This is one such tale. Our guest-star this issue, Wildcat, seems to have been one of Haney’s favorites, and he certainly makes a number of return appearances, most of them fairly good. In this tale, which bears much more in common with that rather striking cover than you’d think likely, as we first find the former costumed hero down on his luck in a flophouse. Bruce Wayne has come seeking the undefeated former heavyweight champion of the world, and he has found Ted Grant a shell of the man he once was. Bruce asks the older man what happened, and Grant, in terse, bitter sentences replies that he had opened a gym to help underprivileged kids, but got drawn into the problems of the inner city. He went into debt trying to help, and suddenly found himself quite alone when the money ran out. Wayne offers to pay his debts, saying he has come to get Grant’s help. It seems there is a youth Olympic-style set of games in the offing, and the U.S. of A. needs someone to coach the boxers. Who better than the Champ? Interestingly enough, Bruce himself is coaching the fencing team. It makes sense that Bruce Wayne, wealthy socialite that he is, would be a fencer, but does it follow that he’d be good enough (publicly) to justify such a position? Well, it’s a Haney tale, so we shouldn’t peer too closely behind the curtain. Convinced that he has nothing to offer anyone, grant turns the job down, but when he hears Bruce getting jumped right outside his window, he leaps into action without a second thought, laying out the two thugs who were robbing the millionaire. This gives him a dose of confidence, and he agrees to join the team. As they leave, Bruce tosses a roll of bills to the two “thugs,” who he had hired for just that purpose. Cut to Vienna, where the games are being held, and we find a very Rocky-esq twist in the plot when Grant is challenged and insulted by an Russian ex-boxer named Koslov, who claims the Champ was too chicken to fight him back in the day. Interestingly enough, this comic predates the famous boxing film by six years! Well, Ted brushes off the insults, and his young team begin to wonder if the Ruskie’s claims are true! Just when I bet you’re beginning to wonder if any actual superheroes will make an appearance in this book, Batman slips over to meet with military intelligence in downtown Vienna. They brief him on the mission they’ve asked him to perform, intercepting the plans for an armed satellite from a turncoat agent who is planning to sell them to the Russians. To my mind, this gives us the real reason that Bruce got involved with these games, as it gave him an excuse to travel around in his civilian guise without being connected to Batman. In costume, he starts his investigation, and back in the non-Olympic village, the Russian coach is stirring up trouble and continues to badger the Champ. Afterwards, the veteran boxer confesses to Bruce that he may very well be afraid of Koslov. After all, the fellow is younger and in better condition than he is, and his nom de guerre is “The Hammer!” If you share a nickname with Charles Martel, you’ve got to be tough! It seems that Grant’s confidence was shaken even worse than it seemed by his setbacks in life! Finally, Koslov jumps into the ring with the retired hero and shoves him, at which point Grant slugs him. This gives Koslov the excuse to challenge him to a fight, and in a funny exchange, Bruce tells Ted that he HAS to fight or he could single-handedly lose the Cold War! I’m exaggerating a bit, but from the way the millionaire talks about this challenge, you’d think that the fate of the Free World hung in the balance. “You’ve got to accept the challenge AND win it!” Bruce declares, “You’ve become part of the Cold War–like it or not!” Way to lay it on thick, there, Bats. Grant stalks off, saying he needs time to think, and Bruce slips away to continue his investigation. He finds the spy, but the slippery fink catches sight of him and begins to run. Fortunately, Ted Grant has donned his old costume and taken a motorcycle out for a spin to clear his head, perhaps secretly hoping for some trouble so that he can prove himself once more. He finds it, helping Batman pursue the fleeing spy. Yet, this fellow is one tough customer, and he manages to lose both of his pursuers, further dampening Wildcat’s spirits. The trail gone cold for the moment, Batman decides to check in on his friend, and he finds him climbing onto a famous ferris wheel. Knowing that Grant is waffling and in need of confidence, Batman decides to employ some tough love. He scales the wheel and enters the Champ’s carriage where he declares that Grant MUST fight Koslov, but the fighter is still unwilling, so Batman does the only rational thing left. He punches the boxer square in the face! The Dark Knight swears that “only one of us is going to walk out of this car!” and an epic brawl begins as the wheel slowly turns. When it finally stops, Grant staggers out, victorious! Batman, looking quite the worse for wear, thinks that he “laid down a bit so Ted could win,” but considers that the aging pugilist is still quite a combatant. So, Grant agrees to fight the big Russian (really? Stallone must have been a DC fan, because this sounds quite a bit like Rocky IV! ), and the two start training, but Batman, worried that Koslov might just beat his friend, decides to take out some “insurance.” I love this. Batman decides that there is too much at stake to just trust to Grant, so he rigs the lights and prepares to cheat so that the U.S. could come out on top! It is both perfectly in and perfectly OUT of character for the Dark Knight Detective. On the one hand, Batman is perfectly willing to cheat to win, providing the ends justify the means, but on the other hand, it’s sort of strange to look back and see this extremely political, patriotic Batman. Could you imagine the modern Caped Crusader doing something this patriotic, if slightly unethical? Anyway, after setting up his insurance policy, Batman heads back out on his investigation, but he is gassed and captured by enemy agents! Meanwhile, the match begins, and the Champ comes out swinging. For four rounds he “pounds the hulking “Hammer,” but after he has worn himself out, the Russian begins to clobber him! As they tie up in a grapple, Koslov whispers in his opponent’s ear that his people have Batman, and if Grant doesn’t want to see him die, he’d better throw the match. Just as things look grim, the lights go out, and Grant lands a knockout punch! Now, here is the only really weak point in the story. It is just so silly, so ridiculous, so very much Zaney Haney, that it threatens to undermine the rest of the tale. Grant, having knocked Koslov out, quickly carries him out of the crowded stadium, throws him in a motorcycle, and proceeds to drive like mad until the Ruskie tells him where Batman is being held. It seems that Batman is on a barge headed down the Danube. Then, not even slowing down, Grant ramps the bike off a convenient bridge, runs over a crowd of enemy agents, and frees the Dark Knight. One wonders how the devil he unties those ropes while still wearing boxing gloves, but that’s far from the craziest thing in this story. The two fight their way out, side by side. And, if that weren’t enough, they, with “The Hammer” in tow, race back to the arena, arriving JUST as the lights come back up! Grant has, naturally, carried the unconscious Russian back into the ring just before, and they proceed to continue their fight. All of that happens in THREE pages. This is a great, though chock-full issue. The ridiculous mad dash at the climax is goofy in the extreme, but the story moves so quickly that Haney gives you no time to consider it. The rest of the tale is good enough that I’m willing to forgive that excess, especially considering the novelty of a flawed, broken hero who has a real arc of growth throughout. Haney would go on to retell this story several times with several different characters, but I think this is the first. It’s a really unusual story for this era, and it is fairly well told. Grant’s presence as Wildcat is negligible, but that’s because this is first and foremost a character piece, as I promised. He is believable as a man broken by life, though that isn’t given as much space as it might have benefited from. It’s a story we’ve heard before, but seeing it in this context is new and interesting. It’s also just a good story, and it brings Wildcat back to the main DCU, rescuing him from obscurity, which is always great to see for a good character. I’ll give this fast-paced story of redemption, this Rocky-in-a-cape drama, a 4.5 Minutemen out of 5. -As C.S. Lewis wrote in The Last Battle, and that’s where we’ll be heading next week with the next installment of Into the Bronze Age, March 1970 Part 2! I’m going to be doing 3 or so issues a post, as I think that’s a good reading length. This should also allow me to keep up a schedule of one or two posts a week. I hope you’ll join me for the exciting next issue!